Recently, we recommended serving a Cabernet with steak and butter-rich foods, partly because of the wine’s tannins. But what are tannins, actually? Tannins are polyphenolic compounds naturally found in plants that bind to proteins and other organic compounds. In other words, they are naturally found in the skins, stems, and leaves of grapes, and they are attracted to proteins, like those in meat. Thus, pairing highly-tannic wines with protein-rich dishes makes them seem less astringent, much smoother. The wine’s tannins race toward the meat instead of your saliva! Because tannins are produced naturally, you may not be surprised to hear that several of your favorite foods also contain them: walnuts, pecans, hazelnuts, strawberries, blueberries, cranberries, cloves, cinnamon, red and white beans, smoked fish and meats, and chocolate liquors, just to name a few! Tannins have even been known to display antibacterial properties, according to a study conducted by Hisanori Akiyama, Kazuyasu Fujii, Osamu Yamasaki, Takashi Oono and Keiji Iwatsuki. For more info about tannins and related topics, check out the article “The Science of Aging Wine” in Vintage Cellars’ Wine Storage Education Center. Visit Vintage Cellars’ Wine Storage Education Center! Have a question about how wine cooling systems work? Wondering about the similarities and differences between various wine racks and wine racking kits? Need help choosing the right wine cabinet for your needs and living space? Perhaps you simply want to learn more about how wine preservation systems work to keep your open bottles as fresh as possible? Now is the time to take advantage of Vintage Cellars’ own Wine Storage Education Center. Packed with information about these topics, plus additional information pertaining to various wines, opening and serving wine, wine cellars, humidity control, thermoelectric and vapor compression cooling, the science of aging wine, wine glasses, decanters, and much more, the Wine Storage Education Center is your source for information concerning all things wine-related. With technical, historical, and even scientific articles, you’re bound to come away learning something new about the wine you love. And perhaps you’ll be inspired to try some of the tips you read at home? An example of a versatile article that covers much ground is Stephanie Warren’s The Science of Wine Aging. In this engaging composition, Stephanie succinctly provides a brief history of wine aging, delves into the chemistry of wine aging discussing compounds like esters and tannins, explains how oxidation impacts wine, and reveals the ideal conditions in which wines age the best. That’s quite a bit! Wine Opener: A step-by-step article on how to properly present and open a bottle of wine at the table. In Decanters & Decanting, decanting procedures are discussed in detail along with how decanting varies for wines of various ages, how quickly to serve wines after decanting, etc. 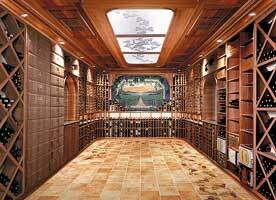 The Wine Storage Education Center is designed to be a valuable resource to enhance your wine enjoyment. Visit often to learn about the latest developments in wine technology, as well as wine basics!